The Crows were shaken from their nest as the Lions cruised into round 3 of the Senior Cup. At a rainswept Nyetimber Lane, the Lions were looking to build on their recent good form. As early as the third minute the opening goal gave them just the start they needed. A goalmouth scramble had the ball bundled home, the final touch being given to Lions' skipper Jamie Horncastle. Crowborough immediately hit back, with Jack Turner pinging a shot back off the post. 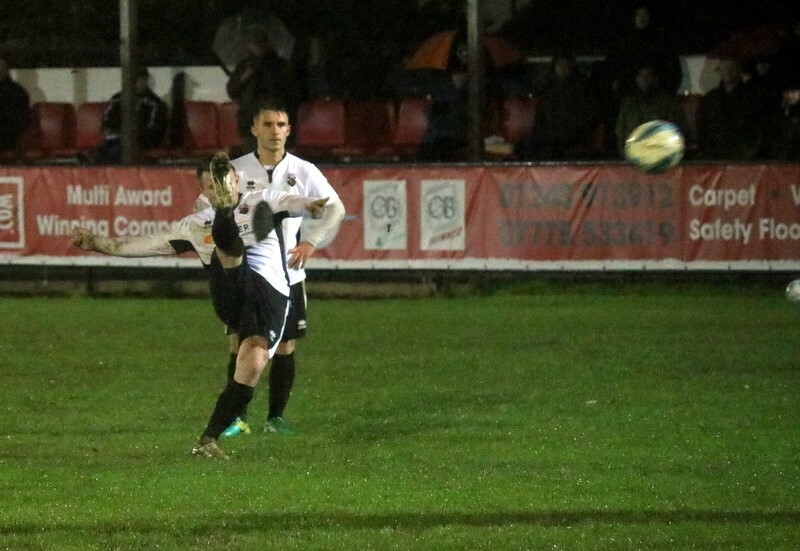 It was end to end stuff, with chances for Pagham's Overton & Simmonds & the visitors' Tom Pearson. Pagham also hit the bar, saw shots hacked away & Andy Chick was unlucky on 21 minutes as a superb run and shot went begging. James Binfield was also being kept busy, the Lions' keeper doing well to keep the Crows from scoring. That they almost did on 28 minutes, Pearson's wicked shot being deflected away. Lloyd Rowlatt and Dan Simmonds combined well on the half hour, keeping Crowborough 'keeper Barnard busy. On came the visitors trainer as the rain teemed down. James White was the man in need of treatment, and he was able to carry on. A succession of Crowborough corners each failed to create a scoring chance before Tom Boddy bundled the ball goal-wards, only for James Binfield to pull off yet another save. Joe Kilhams was again looking lively, and a superb ball through to Dan Simmonds saw the latter spurn two chances to score. As the minutes ticked down to the end of the half, Pagham could have been four or five up, Barnard being the star with some excellent stops. Just on the stroke of half time, Jason Barton hit a sublime shot beyond Binfield. Unfortunately for him, the offside flag was raised & the Lions went in a goal to the good. No changes at the break, but it was Crowborough who started the half much the stronger. shots from Connor Pring & Pearson again kept Binfield on his toes. Goal number two for the Lions resulted from Dan Simmonds' tenacity & Andy Chick's skill on the ball. A pair of substitutions followed in short order for the visitors, but the changes couldn't stop goal number three for Pagham. A shirt pull on Dan Simmonds saw the Lions awarded a free-kick. Justice was done as Simmonds tucked the ball well beyond Barnard. Daryl Wollers saw yellow just after the hour mark, unjustly some thought following a seemingly innocuous tackle. The Lions kept looking for another goal, but Barnard was doing his best to stop them. In fact it was Crowborough who scored next, a ball in from the right being despatched beyond a helpless Binfield. Having been blameless for the Crows' first goal, Binfield then pulled off a brace of superb saves to keep the Lions in the game with the visitors looking dangerous on the break. Sam Crabb was denied a goal on 76, a Crowborough pincer movement being ended as the ball was hustled out of harm's way. A change for the Lions on 80 minutes, Lloyd Rowlatt's industry being rewarded with a well-earned rest. On came Joe Ashmore to shore up Pagham's midfield. The visitors were by now looking the side more likely, and after having shots charged down, they snatched a second in time added on. Just too little too late, to leave the Lions with a chance of a plum tie in round three.